It's Nice to Be Nice (INTBN) International | "Because we are our sisters’ keepers"
Through our Female Adult Literacy Program, It’s Nice To Be Nice (INTBN) International provides free basic reading and writing classes for females 17 years and over. The classes are designed for individuals who have not received any formal education and are taught by a multilingual instructor/educator from Gambia. And, along with education INTBN also provides employment opportunities for women. 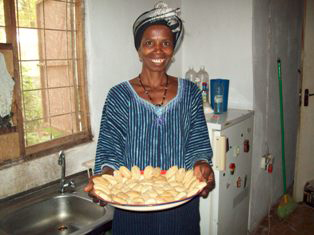 INTBN began offering literacy classes to women in Gambia in 2009. At that time the female literacy rate was 32.5%. Today, the literacy rate among woman in Gamiba is 41.9%!! We are making a difference. Past students that have excelled are now being trained as future teachers of the program!! Our curriculum also includes classes on female health and wellness. Not being able to read has left illiterate women at a severe disadvantage in these critical areas. We educate on issues of reproductive health and sexually transmitted infection including HIV/AIDS as well as general health and well-being. Participation in our 8-month literacy program for one woman is provided at the cost of $350. This low cost includes all administrative costs as well as FREE transportation to all of our program participants. We need your help to educate 60 women in Gambia in 2016. It’s Nice to Be Nice (INTBN) is a registered 501c3 non-profit organization and all donations and contributions to INTBN are tax deductible. Our organization has been registered in The Gambia since Feb of 2005 as a charity organization. INTBN promotes and supports female self sufficiency and economic empowerment. The organization provides minimal financial assistance and guidance for females to start their own small local businesses. This empowers the women to be self reliable, financially productive and adding to the economic growth of their families, communities, nation and the world. Health fairs are an effective way to provide valuable health information and screening services to the community. INTBN provides informative health fairs to community organizations, churches, senior citizens facilities and groups. We provide valuable medical information at these events , some these events basic screenings for Diabetes and Hypertension. Increase prevention, awareness and compliance of infectious and non infectious diseases in the communities we serve and maintenance/management of diseases. For information on The Gambia please visit these sites.